Make sure guests have fun while giving back! For the last 20 years, we’ve been working with various private and public organizations to provide entertainment for fundraising events, auctions, and galas. Our range of charity event performance options include everything from light continuous music, outstanding soloists, fantastic bands, orchestras, and outgoing hosts that are able to make sure the night runs smoothly while different speakers take the stage. When NRG Music & Productions performs at a fundraiser, guests always have a great time – here are a few reasons why. Customized wedding entertainment and wedding planning are some of the most important things we do at NRG Music & Productions. Our team knows how much time and energy go into planning the big day, and we work to deliver a memorable, engaging performance that goes above and beyond our client’s expectations. After years of experience working with different couples, venues and budgets, our team is able to provide a range of performance styles and songs to meet each client’s needs. Below are just a few of our wedding entertainment options. Many of our clients book a live singer, pianist, or string quartet to provide music before, during, and after their wedding ceremony. From classical arias to contemporary ballads, we have a range of elegant options to accompany the most special moments of the event. 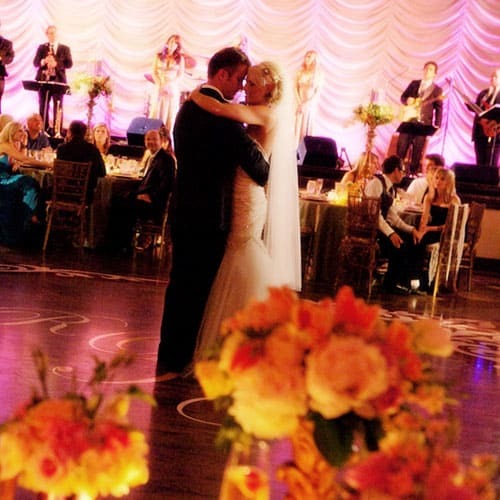 Our professional entertainers work with each client to provide something truly unique and meaningful during each ceremony. After the ceremony is complete, it’s time to celebrate! Music is the key to any great party, so book an amazing wedding band for your guests. Our wedding bands have a huge repertoire of songs to get any crowd moving. Another great option is choosing one of our charismatic and experienced DJs. A great DJ can help coordinate the wedding party, announcing events, and introduce speakers. Furthermore, our DJs will pick the perfect tracks to play in between band sets and pick the right tracks to keep everyone moving on the dance floor! For many, the dream wedding includes a beautiful white dress, fresh cut flowers, and the romantic sounds of a string quartet in the background. Our highly-skilled musicians are able to play a range of classical and contemporary pieces, providing the perfect touch of class and elegance to the special day. This is a great entertainment option to greet guests arriving to the reception, or while enjoy refreshments during cocktail hour. In addition to offering great live wedding entertainment, NRG Music & Productions offers day-of wedding coordination services including equipment setup and break down. Our team can work with performers and staff by assisting with directions, parking, and making sure they know which guests to honor during the celebrations.